Also serving communities of Canton. To help you with your search, browse the 2 reviews below for assisted living facilities in Farmington. On average, consumers rate assisted living in Farmington 3.5 out of 5 stars. Better rated regions include Augusta with an average rating of 4.3 out of 5 stars. Caring.com has helped thousands of families find high-quality senior care. To speak with one of our Family Advisors about assisted living options and costs in Farmington, call (855) 863-8283. Farmington, Maine, is a small, quiet community of 7,633 residents, 20.2 percent of whom are 65 or over. To help accommodate this population of seniors, there are two assisted living facilities within Farmington. In Farmington, as in the rest of Maine, assisted living facilities are officially known as assisted living programs (ALPs) and they are regulated by the Maine Department of Health and Human Services (DHHS), Division of Licensing and Regulatory Services. Weather in Farmington is relatively pleasant. The average high in July is 79 degrees. The fall features beautiful foliage, a great time for taking strolls around the grounds of an assisted living facility. Winters in Farmington can be challenging for seniors who don't like snow. The area receives an average of 87 inches a year. The cost of living in Farmington is quite affordable. On a cost of living index where the national average is 100, the cost of living in Farmington sits at 88.8, well below the national cost of living average and the overall state average for Maine, 105. Surprisingly, for such a small town, crime in Farmington is relatively moderate compared to state and national averages. On a scale of one (low crime) to 100 (high crime), Farmington ranks at 46.9 for violent crime, which is well above Maine's rank of 5.7. Property crime rates in Farmington are 47.2, almost twice of that of Maine's 47.1. Families searching for assisted living communities in Farmington may want to inquire about security measures at the assisted living communities they visit. Farmington is located in Franklin County, and the county has a number of transportation services available, including Western Maine Transportation Services, which are open to the public for M-F daytime rides. Riders can schedule a curb-to-curb ride between 7:30am - 5pm M-F, and vehicles are equipped with wheelchair lifts. Discount fares of $1.50 are offered to seniors 60 and older. Farmington is home to world-class medical facilities, including Franklin Memorial Hospital, in the event of medical emergencies or illness. Franklin County, where Farmington is located, has an array of community resources for seniors, including Seniors Plus, an organization in nearby Lewiston that helps adults make informed choices about aging well. Assisted Living costs in Farmington start around $0 per month on average, while the nationwide average cost of assisted living is $4,000 per month, according to the latest figures from Genworth’s Cost of Care Survey. It’s important to note that assisted living rates in Farmington and the surrounding suburbs can vary widely based on factors such as location, the level of care needed, apartment size and the types of amenities offered at each community. MaineCare, which is Maine's state name for Medicare, offers the Consumer Directed Attendant Services Program, sometimes simply called Attendant Services, in which participants can select their own care providers, paid for by MaineCare, regardless of where the senior resides, including in an assisted living facility. Farmington and the surrounding area are home to numerous government agencies and non-profit organizations offering help for seniors searching for or currently residing in an assisted living community. These organizations can also provide assistance in a number of other eldercare services such as geriatric care management, elder law advice, estate planning, finding home care and health and wellness programs. To see a list of free assisted living resources in Farmington, please visit our Assisted Living in Maine page. 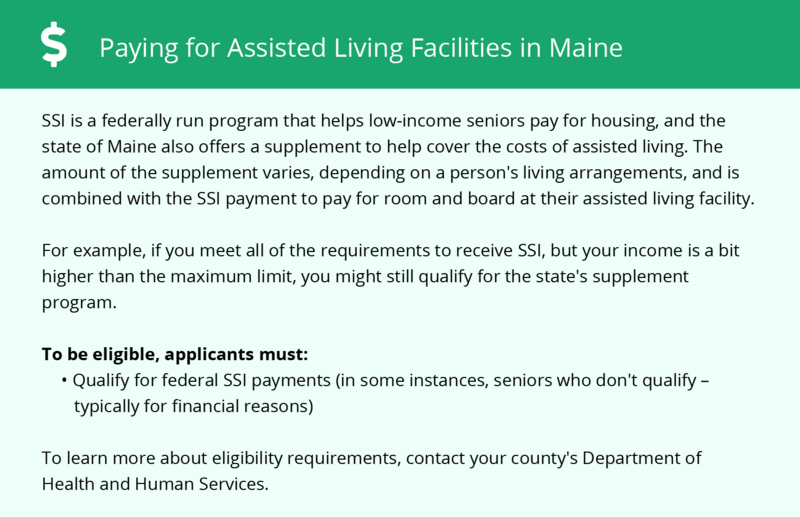 Farmington-area assisted living communities must adhere to the comprehensive set of state laws and regulations that all assisted living communities in Maine are required to follow. 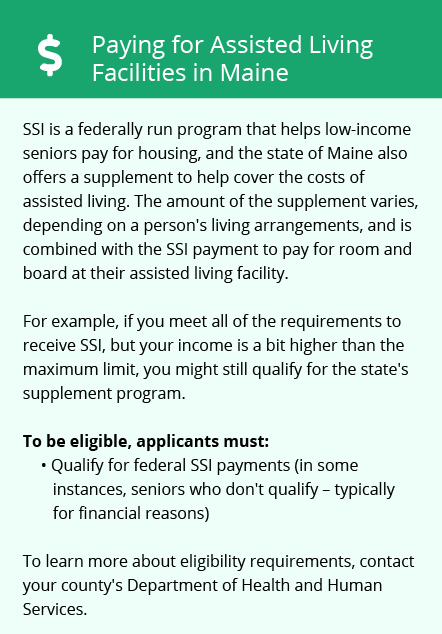 Visit our Assisted Living in Maine page for more information about these laws.